To Cite: Ince F D, Atay A, Koseoglu M H, Ellidag H Y, Yesil M, et al. The Severity of Coronary Artery Disease and Methylenetetrahydrofolate Reductase (MTHFR) Enzyme Gene Polymorphism, Int Cardio Res J. Online ahead of Print ; 10(4):e9805. Background: Some mutations of methylenetetrahydrofolate reductase (MTHFR) gene cause a decrease in MTHFR activity. Decreased MTHFR activity may, in turn, be associated with increased plasma homocysteine level and vascular disease. Objectives: This study aimed to assess the effect of homocysteine, MTHFR C677T, and A1298C gene polymorphisms on the extent and severity of coronary artery disease (CAD). Methods: This study was conducted on 53 patients with the diagnosis of myocardial infarction. According to the results of coronary angiography, Reardon coronary artery scoring was applied to assess the extent and severity of atherosclerosis. MTHFR C677T and A1298C gene mutations and serum homocysteine, folate, and vitamin B12 levels were analyzed, as well. Results: TT genotype of MTHFR C677T gene polymorphism was not found in any of the patients. On the other hand, the incidence of CC and CT genotypes in MTHFR C677T gene polymorphism was 47.2% and 52.8%, respectively. Besides, the incidence of AA, AC, and CC genotypes in MTHFR A1298C gene polymorphism was 37.7%, 45.3%, and 17%, respectively. The results showed no significant difference among different MTHFR genotypes regarding the extent and severity of CAD. Additionally, serum homocysteine, folate, and vitamin B12 levels were not associated with the extent and severity of CAD. Conclusions: Although most studies have found a relationship between homocysteine and MTHFR C677T and A1298C gene polymorphism, this relationship was not observed in our study. According to the results, the severity of CAD was not affected by homocysteine level or MTHFR genotypes. Thus, investigation of different MTHFR gene polymorphisms in a larger number of participants would help understand the genetic basic of CAD. Hyperhomocysteinemia is an independent risk factor for coronary artery disease (CAD) (1). Besides, a strong correlation has been detected between moderate increase in homocysteine and development of atherosclerosis (2). Changes occurring due to nutritional and genetic disorders developing during the methylation phase of homocysteine metabolism can induce increase in homocysteine levels. Moreover, methylenetetrahydrofolate reductase (MTHFR) enzyme induces formation of the active form of folate, which is required for the methylation phase of homocysteine. Human MTHFR gene is localized at chromosome 1p36.3 (3). Point mutation becoming evident as a result of replacement of cytosine (C) localized at 677th nucleotide of the gene encoding MTHFR enzyme by thymidine induces substitution of alanine at 226th position of a gene-product protein by valine. Homozygous mutant MTHFR C677T gene has been demonstrated to induce a decrease in enzymatic activity and hyperhomocysteinemia (4). Homozygous mutant MTHFR C677T gene, which is prevalent among Japanese population, has been found to be associated with CAD. Besides, a correlation has been observed between the genotype frequency and disease severity (5). In another mutation determined in the MTHFR gene as a result of replacement of adenine (A) by cytosine (C) at the 1298th nucleotide of the enzyme encoding gene, point mutation induces substitution of glutamine in the MTHFR protein by alanine. In this mutation, as seen in another type of mutation, the activity of MTHFR decreases. Even though increase in MTHFR A1298C polymorphism does not suggestively affect plasma homocysteine concentration as much as MTHFR C677T polymorphism, the significance of this polymorphism has not been elucidated yet (6). In addition to the importance of homocysteine in development of cardiovascular diseases, MTHFR A1298C mutation has been thought to be a potentially important risk factor for cardiovascular diseases (7). Despite relevant data, MTHFR gene polymorphisms and their adverse effects on coronary arteries have not been clarified yet. The present study aims to investigate the effect of potential MTHFR gene variations on the extent and severity of CAD based on angiographically established scoring system in patients diagnosed with acute myocardial infarction. Predetermination of MTHFR gene polymorphisms that may lead to hyperhomocysteinemia, which is an important risk factor for CAD and exerts adverse effects on coronary arteries, will provide selection of individualized treatment modalities resulting in a decrease in morbidity and mortality rates. This study was conducted on 53 patients (males: n = 36, 54 ± 10 years old; females: n = 17, 55 ± 14 years old) who were hospitalized in the Cardiology Service with the diagnosis of acute myocardial infarction and underwent coronary angiography. The patients who were receiving vitamin supplements, which could affect homocysteine metabolism (folate, vitamin B12, and B6), were excluded from the study. It should also be noted that the patients were not under standard nutritional regimens. Body mass indices (mean ± SD) of male and female patients were calculated as 28 ± 5 kg/m2 and 27 ± 4 kg/m2, respectively. This study was performed in compliance with the declaration of Helsinki and good clinical practice guidelines. Additionally, written and undersigned consent forms were obtained from the patients prior to the study. Blood samples were obtained from the patients within 24 hours after the diagnosis of myocardial infarction. The samples were drawn into vacuum tubes with gel (Serum Separator Tubes, BD Vacutainer, UK/Ireland) for measurement of homocysteine, folate, and vitamin B12 levels and were centrifuged at 1500 g for 10 minutes. Then, the serum portions of the blood samples were separated and kept frozen at - 20°C until analysis. Serum homocysteine, folate, and vitamin B12 levels were measured using cheniluminescence method (Advia Centaur, Simens Healtcare Diagnostic, Germany). Accordingly, homocysteine levels ≥ 13.9 μmol/L were considered as hyperhomocysteinemia. In order to analyze C677T and A1298C gene polymorphisms of MTHFR enzyme, blood samples were drawn into tubes with EDTA (EDTA tubes, Grenier Bio-One GmbH, Austria/Germany) and their DNAs were extracted. These DNA extracts were stored frozen at - 20°C until analysis. The frozen extracts were thawed at room temperature and analyzed using reverse hybridization method (CVD StripAssay, ViennaLab Labordiagnostica, Austria). In evaluation of C677T gene polymorphism of MTHFR, homozygous normal (CC), heterozygous (CT), and homozygous mutant (TT) genotypes were detected. 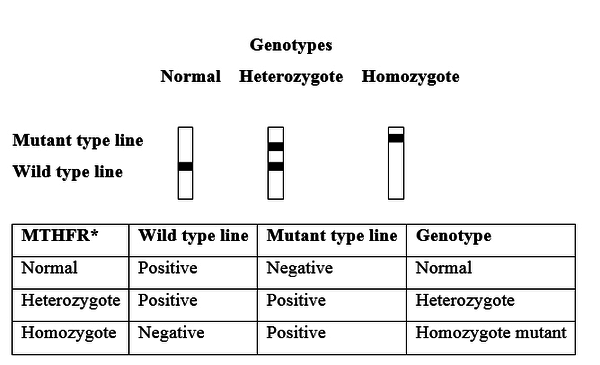 On the other hand, in evaluation of A1298C gene polymorphism of MTHFR, homozygous normal (AA), heterozygous (AC), and homozygous mutant (CC) genotypes were detected (Figure 1). *A band pattern was obtained for each polymorphism. Based on the coronary angiography results, coronary artery scoring formulated by Reardon et al. was used for evaluation of the extent and severity of atherosclerosis (8). Accordingly, coronary circulation was divided into left main coronary artery, upper, middle, and lower segments of the left anterior descending artery, upper and lower segments of the circumflex artery, and upper and lower segments of the right coronary artery. The extent scores were 0, 0.5, 1, 2, and 2.5 for normal vessels, lesions isolated in the side branch of the main vessel, lesions isolated in the main vessel, diffuse lesions in the main vessel, and diffuse lesions in a main vessel and its side branch, respectively. In addition, the total extent score was calculated by summing up the scores assigned to all the segments. Moreover, the severity scores were 0, 10, 15, 20, and 25 for coronary lesions with < 50%, 50 - 75%, 76 - 89%, 90 - 99%, and 100% luminal stenosis, respectively. Besides, the total severity score was calculated by summing up the scores assigned to all the segments. The study data were analyzed using statistical package for the social sciences (SPSS) (version 11.0 for Windows, SPSS Inc., Chicago, IL). Chi-square test was used to compare the patients with different genotypes regarding demographic characteristics. Besides, homocysteine, folate, and vitamin B12 levels, extent and severity of CAD, age, and body mass index of the patients with different genotypes were compared by Mann-Whitney-U (for MTHFR C677T gene) or Kruskal-Wallis test (for MTHFR A1298C gene). In addition, Spearman’s correlation was used to assess the correlations between folate and vitamin B12 levels. P < 0.05 was considered to be statistically significant. In our study, no homozygous mutant (TT) genotypes were detected for MTHFR C677T gene. However, the frequencies of homozygous normal (CC) and heterozigous (CT) genotypes were found to be 47.2% and 52.8%, respectively. Besides, the prevalence of alleles was significantly different (CC: 54.2%, CT: 38.9%, TT: 6.9%) from those predicted by the Hardy-Weinberg equilibrium (P = 0.009). For MTHFR A1298C gene, on the other hand, homozygous normal (AA), heterozygous (AC), and homozygous mutant (CC) genotypes were found in 37.7%, 45.3%, and 17% of the cases, respectively. Additionally, the prevalence of alleles was not different (AA: 36.5%, AC: 47.9%, CC: 15.7%) from those predicted by the Hardy-Weinberg equilibrium (P = 0.697). The results showed no significant difference in the patients’ clinical and demographic characteristics according to MTHFR A1298C genotypes. However, a significant difference was found between the patients having CC and CT genotypes of MTHFR C677T gene polymorphism regarding the number of cases with familial CAD. Moreover, no significant difference was observed between the patients with CC and CT genotypes of MTHFR C677T as well as among those with AA, AC, and CC genotypes of MTHFR A1298C concerning the number of cases with hyperhomocysteinemia (Tables 1 and 2). Abbreviations: CC, CC genotype; CT, CT genotype; TT, TT genotype in MTHFR C677T gene polymorphism. bChi-square test. P < 0.05 is statistically significant. Abbreviations: AA, AA genotype; AC, AC genotype; CC, CC genotype in MTHFR A1298C gene polymorphism. The relationship between different genotypes of MTHFR C677T and A1298C and serum homocysteine, vitamin B12, and folate levels and the extent and severity of CAD has been presented in Tables 3 and 4. Accordingly, no significant difference was found among different genotypes of MTHFR C677T and A1298C regarding serum homocysteine, vitamin B12, and folate levels and the extent and severity of CAD. bMann-Withney-U test. P < 0.05 represents statistical significance. aThe results were given as mean and 95 % confidence interval. Furthermore, the results indicated no correlations between biochemical parameters and severity of CAD (P > 0.05). Considering the correlation among serum homocysteine, vitamin B12, and folate levels also, a significant correlation was only detected between serum vitamin B12 and folate levels (P < 0.05, r = 0.370). The present study results revealed no significant difference between the normal and mutant genotypes in MTHFR C677T and A1298C gene polymorphisms in terms of serum homocysteine levels. Also, no significant difference was found among the normal, heterozygous, and mutant genotypes of MTHFR A1298C polymorphism regarding folate and vitamin B12 levels. However, there was a significant increase in folate level in heterozygotes of MTHFR C677T gene polymorphism. This increase in the folate level might have prevented elevation in homocysteine concentrations. Endothelial dysfunction developing in coronary artery carried a risk for atherosclerotic arterial diseases (9). On the other hand, hyperhomocysteinemia that impaired nitric oxide dependent vasodilatory function contributed to development of endothelial dysfunction (10). Therefore, hyperhomocysteinemia has been demonstrated to be an independent risk factor for CAD (1, 2). With mutation in the MTHFR C677T gene, MTHFR enzyme becomes thermolabile and MTHFR activity decreases by 65% and 30% in homozygous mutants (TT) and heterozygotics (CT), respectively (11). In MTHFR A1298C homozygous mutant (CC) genotypes, a 40% decrease occurred in MTHFR activity, while MTHFR activity decreased by 40 - 50% in combined MTHFR C677T and A1298C heterozygous genotypes (CT plus AC) (12). The results of the study by Kadziela et al. indicated that homocysteine levels were higher in the CAD patients with TT genotype (9.2%) in MTHFR C677T gene polymorphism compared to those with CT and CC genotypes (15.4, 11.0, and 11.2 µmol/L, respectively, P < 0.001). However, the risk of CAD was not significant in patients with TT genotype. Furthermore, homocysteine levels showed a reverse correlation with folic acid and vitamin B12 concentrations. Thus, homocysteinemia rather than MTHFR gene mutation was thought to be a risk factor for CAD (13). Besides, some studies have demonstrated a relationship between hyperhomocysteinemia and severity of CAD irrespective of the presence of MTHFR C677T gene polymorphism (14). Tokgozoglu et al. found that the frequency of CC, CT, and TT genotypes was 45.8%, 46.8%, and 7.4%, respectively in CAD patients, which were not different from distribution of these genotypes in healthy individuals. Indeed, they detected significantly higher plasma homocysteine levels and severity of coronary atherosclerosis in patients with TT genotype compared to those having other genotypes. They found no correlations between plasma homocysteine and vitamin B12 levels. However, they detected a negative correlation between homocysteine and folate levels, and asserted that plasma folate concentrations below the median value (< 5.7 ng/mL) caused a risk for CAD (15). In the present study, folate levels were > 5.7 ng/mL in the patients with different genotypes of MTHFR C677T and A1298C (Tables 3 and 4). This might have prevented elevation of homocysteine concentrations. Although TT genotype was not detected in our study, CC and CT genotypes were found in 47.2% and 52.8% of the patients, respectively. Since this study aimed to analyze the severity of CAD and genetic predisposition, there was no need to include a healthy group to evaluate the differences among the genotypes regarding the risk of CAD. Our study results revealed no significant difference among the patients with various MTHFR genotypes concerning the extent and severity of CAD, which might be attributed to the absence of TT genotype. In the study performed by Morita et al. in a Japanese population, the frequency of MTHFR C677T mutant (TT) genotype was significantly higher in CAD patients compared to healthy individuals (16% and 10%, respectively, P = 0.006). In addition, the frequency of this genotype was associated with the severity of CAD (5). Heidari et al. also reported a significant relationship between MTHFR TT genotype and coronary atherosclerotic lesions in an Iranian population (16). According to Gu et al., T allele of MTHFR C677T gene polymorphism carries a risk for coronary atherosclerosis and increases the severity of atherosclerosis (17). In the study conducted by Girelli et al., the frequency of CC, CT, and TT genotypes was 32.4%, 53.2%, and 14.4%, respectively in CAD patients. Besides, homocysteine levels were significantly higher in TT homozygotics in comparison to those carrying CT and CC genotypes. Additionally, a negative correlation was found between homocysteine levels and folate and vitamin B12 levels. However, no difference was observed among the genotypes with respect to homocysteine levels in patients with folate concentrations above the median level (> 3.87 ng/mL). Yet, homocysteine levels were observably higher in the individuals carrying TT genotype comapred to those carrying other genotypes in patients with folate concentrations below the median value (< 3.87 ng/mL). Overall, they asserted that only MTHFR C677T gene polymorphism was not an independent risk factor for CAD (18). In the study performed by Senemar et al., on the contrary to MTHFR polymorphism, homocysteine concentrations increased in line with the increased number of stenotic vessels (19). Nevertheless, some studies could not demonstrate any correlations between MTHFR C677T gene polymorphism and CAD and its extent and severity (20, 21). As seen in MTHFR C677T polymorphism, MTHFR activity also decreased in MTHFR A1298C polymorphism. In the study conducted by Freitas et al., TT and AA genotypes detected in both MTHFR C677T and A1298C polymorphisms were strongly associated with higher homocysteine levels. In addition, the frequency of AA genotype increased in the CAD group (22). In contrast, Yenilmez et al. reported that in MTHFR A1298C polymorphism, the patients with AC (53.8%) and CC (8.5%) genotypes had 1.9 and 1.4-fold higher risks of CAD in comparison to those with AA genotype (37.6%) (23). Nonetheless, Rothenbacher et al. found no significant difference between the CAD patients and the control group concerning homocysteine levels and MTHFR C677T and MTHFR A1298C polimorphisms (24). Kerkeni et al. also conducted a study in an Tunis Arabian population and showed no significant difference between the CAD patients and the control group with regard to the frequency of MTHFR A1298C genotype. Nevertheless, they detected a significant difference between the two groups concerning the frequency of TT mutations in MTHFR C677T gene polymorphism (16% and 5.8%, respectively). In conclusion, they demonstrated a relationship among MTHFR C677T gene polymorphism, hyperhomocysteinemia, and incidence of CAD. However, they found no correlation between both MTHFR polymorphisms and the number of stenotic vessels (25). In the study performed by Kolling et al. in patients with CAD, the frequency of CC, CT, and TT genotypes of MTHFR C677T polymorphism was 43.1%, 45.0%, and 11.9%, respectively. The frequency of AA, AC, and CC genotypes of MTHFR A1298C polymorphism was also 45.9%, 42.7%, and 11.4%, respectively. The results of that case-control study indicated no significant relationships between polymorphisms of MTHFR C677T and A1298C genes and CAD. However, there was a relationship between increased homocysteine levels and CAD (26). In our study, the frequency of AA, AC, and CC genotypes of MTHFR A1298C polymorphism was 37.7%, 45.3%, and 17 %, respectively. Besides, no significant difference was observed among the genotypes regarding the extent and severity of CAD. Various studies have demonstrated that serum homocysteine levels could be affected by nutritional factors, such as folate, vitamin B12, and riboflavine, as well as age, gender, and ethnicity (27-30). Furthermore, the results of studies on human and murine MTHFR genes have revealed 15 different mutations in MTHFR genes (31). In our study, only two MTHFR polymorphisms were analyzed. Thus, serum homocysteine levels could have been affected by other mutations. Besides, since our study did not include a healthy control group, coronary artery risk assessment could not be performed. Hence, further studies with larger sample sizes including healthy individuals are recommended to analyzed different MTHFR gene polymorphisms using single nucleotide polymorphism (SNP) array. The current study results did not show any significant relationships among homocysteine levels, MTHFR gene mutation, and severity of CAD. Although the studies on MTHFR gene and CAD have come to controversial results (32-36), the effect of homocysteine on CAD cannot be neglected. Therefore, the molecular causes of CAD can play a role in individualized treatment strategies against CAD. Authors’ Contribution: Study concept and design: Mehmet Koseoglu, Murat Yesil; acquisition of data: Fatma Demet Ince, Erdal Deveci; analysis and interpretation of data: Fatma Demet Ince, Mehmet Koseoglu; drafting of the manuscript: Fatma Demet Ince, Aysenur Atay, Hamit Yasar Ellidag; critical revision of the manuscript for important intellectual content: Mehmet Koseoglu, Aysenur Atay; statistical analysis: Fatma Demet Ince; administrative, technical, and material support: Mehmet Koseoglu, Murat Yesil; study supervision: Mehmet Koseoglu. Implication for Health Policy/ Practice/ Research/ Medical Education: Decreased MTHFR activity is associated with increased plasma homocysteine level and vascular disease. Therefore, the present study aims to investigate the effect of potential MTHFR gene variations on the extent and severity of CAD. Predetermination of MTHFR gene polymorphisms that may lead to hyperhomocysteinemia will provide selection of individualized treatment modalities resulting in a decrease in morbidity and mortality rates.